A souvenir mug from the Sydney International Exhibition. Made by Powell, Bishop and Stonier in Hanley, Staffordshire, England, circa 1879. The cylindrical porcelain mug has a slight flare at rimmed base. 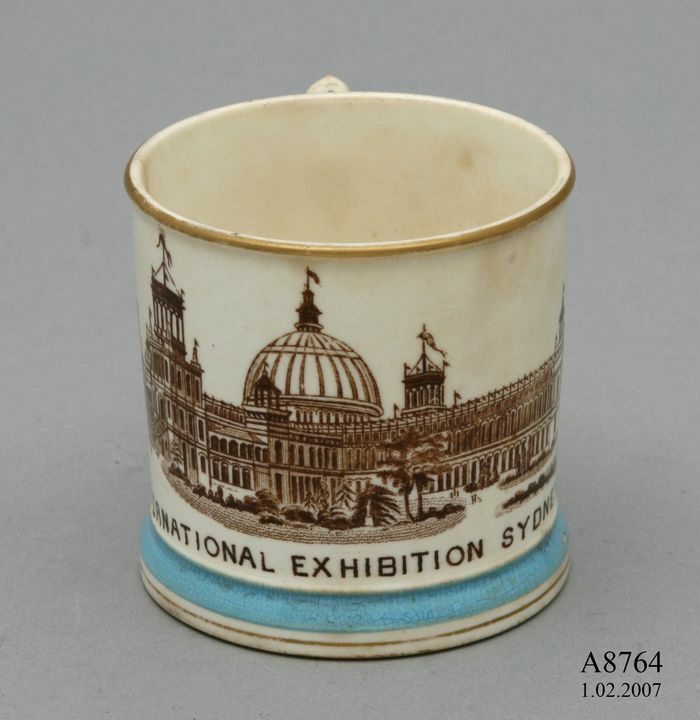 Brown transfer print of Sydney International Exhibition buildings run from handle around the front of the mug with 'INTERNATIONAL EXHIBITION SYDNEY' printed in brown capital letters beneath the illustration. A blue band of colour runs around the mug at the base, a gold rim at the top and gold decoration on handle and around base. On the base of the mug in blue ink is '3 / 2900' and a pattern in green featuring 2 entwined snakes. Powell, Bishop and Stonier was a Staffordshire pottery. Livesey Powell & Co was formed in 1845 by two potting families and the lawyer Frederick Bishop who provided financial support. Livesley retired in 1866 and the partnership became Powell and Bishop. In 1878 they were joined by John Stonier, a Liverpool glass and ceramics merchant. The company produced a range of ceramics and used transfer printing, moulded, painted and lustre decoration. Much of their production was exported with over one million different items being sent to New York in 1851. The company became Bishop and Stonier in 1891 and continued to trade until 1939.